"The choice is between a Likud government and a Tzipi-Buji government," declares Netanyahu on Facebook. 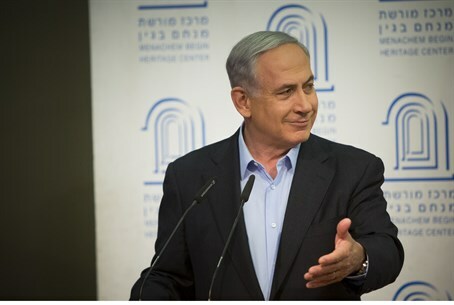 Prime Minister Binyamin Netanyahu declared on Tuesday night that he will not form a unity government with the “Zionist Camp”, headed by Labor leader Yitzhak Herzog and Hatnua chairwoman Tzipi Livni. “I am in favor of a united Jerusalem under Israeli sovereignty, they are against it. I am against giving up Judea and Samaria because any area that is given away will become a terrorist base of radical Islam, and they are in favor. I stand firm in the face of international pressure regarding Israel's security interests, they are only willing to give up, give in, retreat, surrender,” he continued. “So the choice in the upcoming election is between a Likud government under my leadership, and a left-wing government headed by Tzipi and Buji. This is the choice, there is no other choice,” he concluded. The statement comes amid speculations that Netanyahu intends to form a coalition with the Labor-Livni list and the haredi parties. A senior political source predicted on Sunday that Netanyahu will offer Herzog and Livni senior portfolios in his government and that the Jewish Home will be last on his agenda. Meanwhile, Jewish Home chairman Naftali Bennett warned voters this past weekend that the Jewish Home may not be part of the 20th Knesset's coalition unless it has 15 or 16 seats. This, he warned, would bring about the establishment of a Palestinian state by 2017. A Channel 2 poll released on Tuesday evening found that Labor is on top again and that Yachad-Ha'am Itanu may be on the upswing too. Labor would garner 24 seats in the 20th Knesset. Likud is in second place with 22. Two other polls, published by the Knesset Channel and Haaretz, predicted a neck-and-neck race between Labor and Likud and placed Ha'am Itanu at just four seats.